Shapened points with knurled center. Point reverses into body for safety. Knurled body with no roll hex head. FLAT LEG DIVIDERS - 3 Inch Diamond brand. FLAT LEG DIVIDERS - 4 Inch Diamond brand. FLAT LEG DIVIDERS - 6 Inch General - USA. 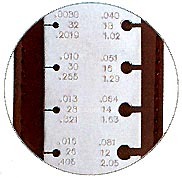 STEEL RULE - FLEXIBLE Inch & mm's 6"x 1/2". Measures inside and outside 3-1/4"/ 80 CM in 1/16" & mm's. 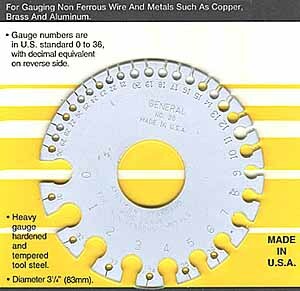 POCKET WIRE GAUGE 3-5/16" x 1"
Measures in American Standard (AWG) 34 through 8 gauge, millimeters and decimal inches. copper, brass and aluminum. 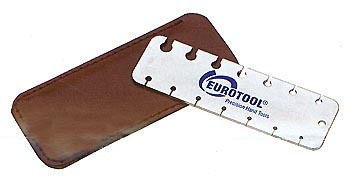 Comes with a protective leather sheath.